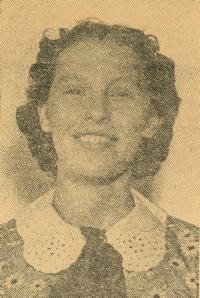 Obituary – Endres, Anna “Janice” (Kirtley) « Perry High School Alumni Association, Inc.
﻿- age 17, daughter of Mr. and Mrs. Charles T. Kirtley, was born November 17, 1923, north of Perry, and has attended grade school and her ninth and tenth grades in county schools other than Perry. She has been here two years, coming here from the Billings high school where she was a member of the Girls’ basketball team. She had one year of girls’ glee club work at Billings and another year in similar activities here. Janice’s hobbies include flower gardening and souvenir collecting. She has not definitely decided what she wishes to do after graduation. Anna “Janice” Kirtley-Endres was born on November 17, 1923 on her family farm a few miles north of Perry, Oklahoma. She was the eighth child of ten children born to Charles Thomas and Frances Jane “Jenny” Sokol-Kirtley. Janice and her family had to work hard for their daily bread on the farm, especially during hard times such as The Great Depression and The Dust Bowl. 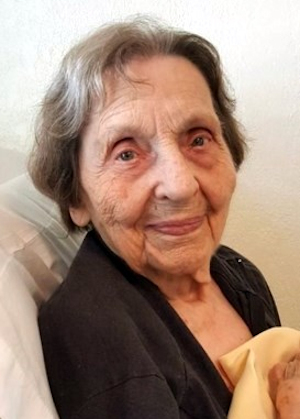 When she was 18 years old, she volunteered to move in with her maternal grandfather, Josef Sokol, to care for him in the last year of his life. On February 21, 1944, she married Walter “Carl” Endres, a local Perry man. Carl was in the Army Air Corps and stationed in Las Vegas, Nevada, so Janice had to take a train from Perry to Las Vegas to meet Carl so they could be wed in Las Vegas. They lived in Las Vegas for a couple of years. On November 8, 1945, Janice gave birth to twin sons, Richard Lawrence and Robert Carl. Because the twins were two months premature, they sadly did not live long after birth. Carl and Janice eventually moved back to Oklahoma. Through the years they have lived in Oklahoma City, Edmond, and Perry. They expanded their family with four daughters, Anna Elizabeth in 1947, Laura Janice in 1950, Mary Carol in 1951, and Rita Teresa in 1955. Carl and Janice were a hard working couple who loved and cared for their family, were strong in their faith, and did what they could to help others. Along with hard work, they made road trips with their four girls including camping at Lake Texoma and traveling to various locations out west. When their four girls married, three of them moving out of state, they enjoyed traveling to visit all of them and enjoyed their time spent with their grandchildren. On February 17, 2002, just four days shy of their 58th anniversary, Carl passed away. Daughter Laura Janice Basile passed away on April 13, 2017. After Carl’s death, Janice continued with her industrious nature. She never liked to be idle, she traveled on vacations with her family, enjoyed working in her garden, as well as cooking, cleaning, sewing, and quilting. She watched her family grow to include fourteen great-grandchildren. She is survived by her three daughters (and spouses), Ann Brutsché (Mike), Mary Endres (M. Stewart), and Rita Harris (Buck), and Son-in-law Claudio Basile; ten grandchildren (and spouses): Lisa Morrow (Rick), Rob Brutsché (Naomi), Joe Brutsché (Laura), Craven Harris, Matt Harris (Shanan), Will Harris (Katy), Marco Basile, Jessica Schweitzer (Zac), Cristina Basile, and Rebekah Berry (Bryan); fourteen great-grandchildren, and many nephews and nieces. She is preceded in death by her husband, Carl, her twin sons, Robert and Richard, and her daughter, Laura Basile.